Welcome back to the Sun Valley Animal Center blog! Spring is right around the corner, which is an exciting time for dog owners. As the temperatures warm up, you will likely be spending more time enjoying the outdoors with your furry friend, getting more exercise, hiking, playing, and going on fun excursions in the wilderness. Therefore, you will want to make sure your dog is ready for any outdoor adventure by ensuring their health and wellness are in top shape. As your Top Rated Local® animal center and veterinary hospital, we have some helpful tips you can follow to prepare your pup for the warmer, more active months ahead. Continue reading below to learn more. One of the greatest threats to your dog’s health is Dirofilaria immitis, also known as heartworms. Heartworm disease, caused by foot-long heartworms, is a very serious disease in pets that causes chronic damage to the heart, lungs, and arteries, which can become fatal. As the weather warms up, bugs and pests like mosquitoes that spread heartworms and other parasites become more active. Pet parents will want to be proactive in taking preventative measures using heartworm medications to protect their dogs from this terrible disease. Along with mosquitos, spring and summer are peak seasons for fleas and ticks. Both of these insects feed on the blood of mammals, and can spread a swath of diseases and parasites to dogs and humans, including Bubonic plague, Lyme disease, and Rocky Mountain spotted fever. Talk with your vet about flea and tick prevention in the form of oral tablets, flea collars, and specially-formulated shampoos. As your dog becomes more active during the warmer months, their muscles and joints are at a greater risk for injury. What’s more, it is very common for dogs to gain a few extra pounds during wintertime when they may not be as active due to colder temperatures and severe winter weather. You can give your dog the vitamins and minerals they need for strong bones, joints, and muscles by feeding them dog-friendly, low-calorie fruits and veggies in place of boxed treats. Healthy veggie snacks – Dogs love raw carrots and celery, cooked, plain sweet potatoes, and steamed green beans and broccoli. Avoid feeding them onions, garlic, and avocados. Healthy fruit snacks – Blueberries, fresh, frozen, or mashed bananas, apple slices (without the seeds, which are poisonous to dogs), and fresh watermelon make excellent dog treats. Avoid feeding them grapes and raisins. Scheduling your furry family member for a wellness exam at our veterinary hospital this spring will allow our veterinarians to examine your dog, update any needed vaccines, offer nutritional counseling, and address any health issues that may affect their quality of life. Contact Sun Valley Animal Center today for an exam. 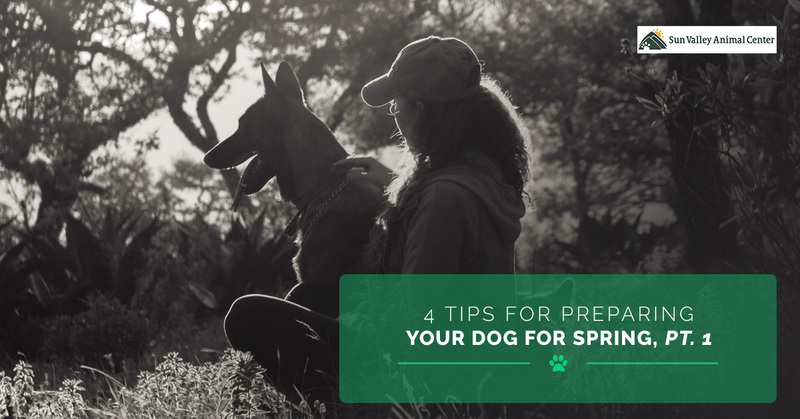 Be sure to join us for part two of this short blog series where we will continue exploring ways to prepare your dog for spring. Thanks for reading!